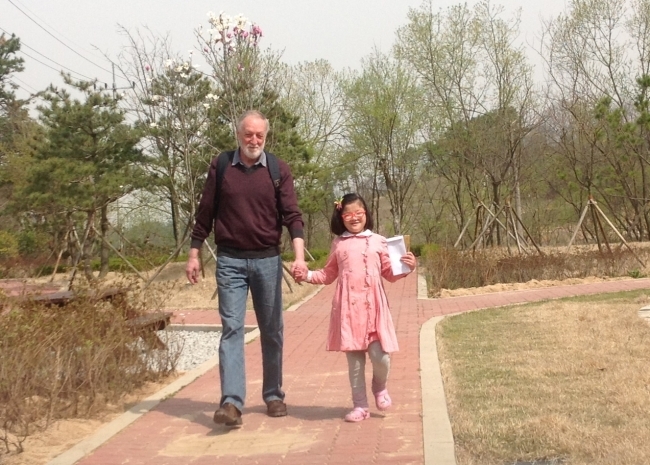 Jeonju-based expat Terry Lyons will be walking the Santiago de Compostela pilgrimage trail this spring to raise money for a severely disabled girl and awareness of orphanages’ needs. Lyons began walking to raise money for Esther Park in 2010, dividing the funds between the Holt orphanage that looked after her and Esther herself, who needed money to pay for growth hormone injections. When Lyons first met Esther, she was in hospital. Her condition meant that, although she was 8 years old, she was just 80 centimeters tall and weighed 10 kilograms. “After seeing Esther in hospital I knew that I wanted to do something to help her and other orphans. More importantly I knew had to,” he said. Since then, he has helped pay for injections to improve her condition and stature, and visited her when he can. Esther is now 13 years old, and has stopped having injections due to her age, but she has grown somewhat, to 1.35 meters tall and 30 kilograms. Lyons said he likes to think that the injections helped, and is glad to see Esther doing some of the things most girls her age do, though he laments her developing candy habit. Due to the orphanage’s rules, she has had to move to a new home, a shelter for people with mental disabilities where Lyons says Esther -- whose disabilities are only physical -- has been treated by the owners as part of the family. “The people that run it have a daughter of their own and they have almost adopted Esther. At this facility she shares a room with one other person. At the orphanage, there were eight other kids in the room,” he said. Sadly, there is a limit to what can be done, and her prognosis remains poor. Esther is blind in one eye and losing sight in the other. She has weak bones and teeth, among other things. Despite this, her medical expenses have fallen. At the orphanage, other support was given, but there was not much provision for children’s health care. But now Esther has completed her hormone treatment, and a doctor visits the shelter regularly to attend to her and residents of her new home. On the other hand there are fewer donations of clothes and things young girls might want. Other people in the local community have helped out too, including a group of expats who hold an annual murder mystery fund-raiser, local businesses and a group of medical students that join him on some of his walks. He also pointed out that many other local people also volunteer at orphanages, but there is still a need for more help. These days Lyons, who can no longer run because of a cartilage problem, says his doctor has recently advised him to keep to half marathons, so he plans to walk 20 kilometers a day on the pilgrim trail. And he hopes his marathon walk along 676 kilometers of the Santiago de Compostela pilgrimage will help raise consciousness of the needs of orphans. He will walk the first 100 kilometers in Korea, owing to time constraints. He said he chose the trail, made famous from centuries of use and appearance in literature and film, because of its religious connections – Holt and many other orphanages are Christian organizations – and because he hoped it might have more of an impact. He still divides the money between Esther and the orphanage, but he said he would also be pleased if his walk prompted people to volunteer. “With awareness you might take a Saturday and go to an orphanage and sit with the kids and think ‘OK I can do that.’ It’s equally important,” he said. And he hopes that it will remind people that there are children in their communities that need help. “Where we are giving children in other countries a chance, what about children in this country. The kids could be brilliant athletes, musicians, technicians, maybe even the president, who knows?” Lyons said.